• Small and compact aluminum housing design. • High stability PLL technology. • Channel indication : 3 digital displays. 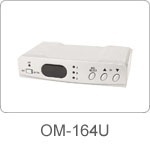 • Convert audio/video signal into TV signal. • Suitable for the home distribution. • Can adjust the UHF output channels. • With 3 A/V input ports.